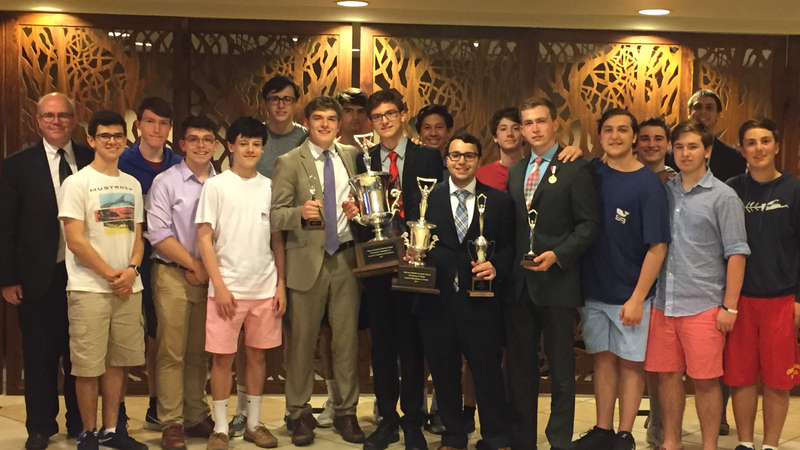 The Robert C. Wright Speech and Debate Team has enjoyed an extremely successful year, picking up numerous hard-earned team and individual titles throughout its long season. That same effort showed this past weekend, May 27-28, as the team traveled down to Louisville, Kentucky to compete in the National Catholic Forensic League Championship Tournament. Speakers and debaters alike spent the better part of the spring qualifying and preparing for this tournament, and only a select few got the chance to compete. 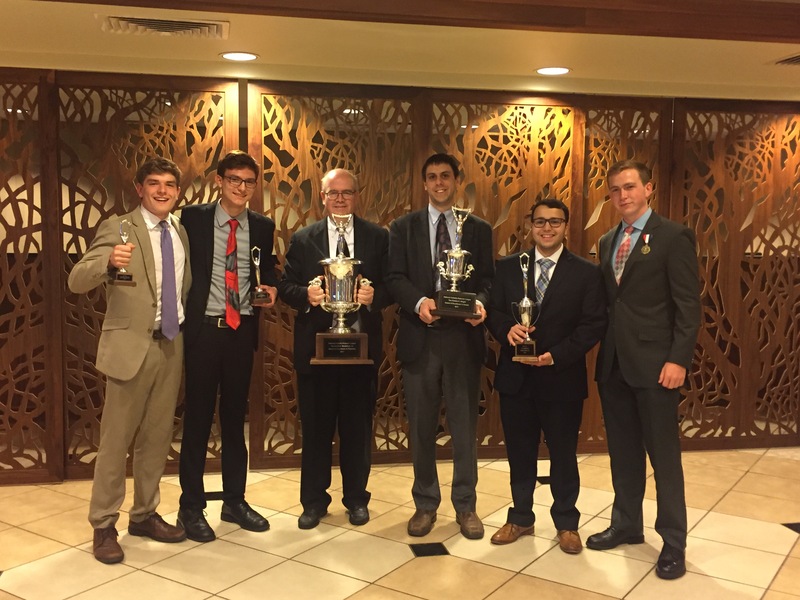 All told, the team sent 17 speakers and debaters to Nationals this year, and each of them made their mark at this prestigious competition. Patrick Johnson ’17, Ryan Vavricka ’20, Bro. John McGrory, S.M. ’84, Mr. Steven Zelubowski, John Michael Magloire ’18, and Conor Lynch ’17 stand proudly with their awards after meeting for the closing ceremony. The tournament started early Saturday morning. Aidan Fitzgerald ’18 and John Michael competed in Lincoln-Douglas debate, and debated through five rounds on Saturday both earning themselves a spot in Sunday’s break rounds. Aidan dropped during the first break round while John charged forward. He crushed countless opponents until he lost in his semifinals round, earning him third place in the entire competition. WIlliam Fuschillo ’19 and Miles Ventura ’19, a fairly new partnership in Public Forum debate, proved themselves as they earned a spot in the second day of debate, but sadly did not pass the first break round. After receiving two awards denoting the excellence of the team, all of the speakers and debaters basked in the glory of their accomplishments. Eager to match the high performance of the debaters, members of the speech team excelled as well on Saturday, advancing several speakers. Ryan Vavricka ’20, new to the team this year, competed in Declamation, and made it to quarterfinals. Conor Lynch ’17 and Patrick Johnson ’17, Speech President, both spoke in the category Original Oratory. Conor made it to octafinals while Patrick advanced to quarterfinals. Overall, the team did a commendable job, and emerged decorated with two honors: a member of the top five best teams in the country and a top five team in debate. After a year of practicing and competing, the team is in its home stretch. Only one tournament remains, the National Speech and Debate Association National Tournament. Seven members of the team will be traveling to Birmingham, Alabama from June 18-23. Still ecstatic from their recent victories, the team looks forward to continuing their winning streak at this last competition. Congratulations to everyone on the team, and good luck for the rest of the year!